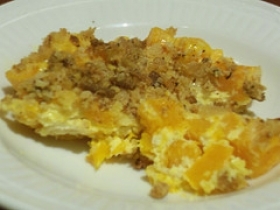 Have you made Buttercup Squash and Spinach Pie? 1. To prepare the DOUGH: In the bowl of an electric mixer fitted with a dough hook, add the yeast, warm water and sugar; stir with a fork. 2. Allow to stand for 10 minutes or until the yeast starts to bubble and foam (PROOF). 3. NOTE: Make sure that the water is NOT hot. Add the milk, olive oil and 3 cups of the flour and salt on low speed; mix to combine. 4. Continue to add flour 1/2 cup at a time, kneading the dough in between at medium speed until the dough pulls away from the sides and feels smooth, soft and, when indented with your finger, springs back nicely. 5. 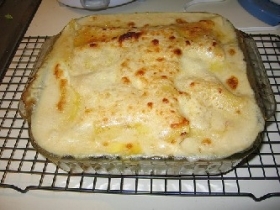 If you feel the dough is too sticky you could add more flour, but it is better on the sticky rather then the dry side. 6. 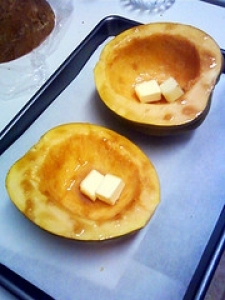 Place the dough in an oiled bowl, cover with a towel and allow to double in bulk. 7. It will take 1 or two hours. For the FILLING: While the dough is rising, prepare the filling. 8. Set the oven a 375 degrees. Oil a baking sheet. 9. 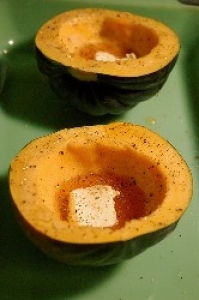 Wash and cut the squash in half and remove the seeds from the center. 10. 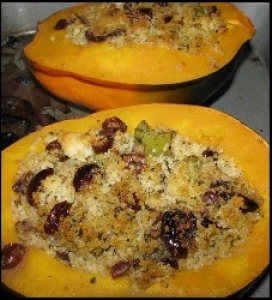 Drizzle the flesh with 1 T of olive oil and turn the squash cut side down on the baking sheet. 11. Bake in a preheated oven for 30 or 40 minutes or until the flesh is soft. 12. Remove from the oven and set aside. In the meantime, in a saute pan heat the remaining T of olive oil until hot. 13. Add the onions and cool over low heat, stirring occasionally for 30 minutes. 14. Add the garlic and cook for 30 seconds. Place the onions in a mixing bowl. 15. 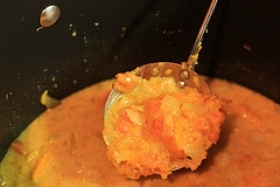 Using a large spoon scoop the flesh from the squash and add it to the onions. 16. Stir in the heavy cream. Season with cinnamon, ginger, nutmeg, allspice, kosher salt, and pepper. 17. Mix all the ingredients together and set aside until cool. 18. When the dough has doubled in size, punch it down and turn into a floured board or counter. 19. Divide the dough in half. Lightly grease a 9x13 casserole baking dish, Using a rolling pin, roll half dough out to form a rectangle large enough to fit in the prepared pan and all the way up the sides. 20. The dough may spring back when you work it but perceive and make sure it fits up the sides. 21. Sprinkle half the Romano cheese over the bottom of the dough. 22. Spoon the cooled filling into the bottom of the pan; smooth over the entire pan. 23. Place the spinach leaves over the squash mixture. 24. This will seem like a lot of filling but it will collapse while it cooks. 25. 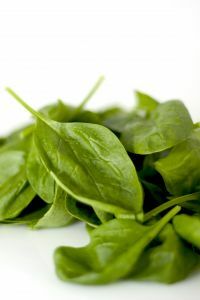 Sprinkle the spinach with the remaining cheese and season to taste. 26. Set the oven at 350 degrees, a , roll out the remaining piece of dough just large enough to fit on the top of the rectangle. 27. Ease the dough onto the top of the filling bringing the bottom edge over the top. 28. Pinch the seams together firmly. With a sharp knife make 4 large holes on the top, spacing evenly. 29. Transfer the pie to the preheated oven and bake for 30 or 40 minutes or until the crust is golden brown. 30. Remove from he oven and cut into squares. This pie is best eaten warmed through. This recipe contains potential food allergens and will effect people with Wheat, Milk, Butter, Gluten, Cheese, Garlic, Natural Sweeteners, Onion, Olive Oil allergies.